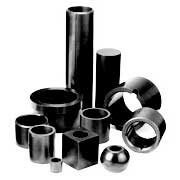 The carbon & graphite bushings that we offer are often used as bearings. These bushings are efficiently used where oil and grease lubricants do not work with corrosive liquids and gases. In such a situation, contamination by conventional lubricants is avoided and here come the uses of our bushings. Our carbon graphite bushings are also used for machining into parts of required sizes. The most interesting aspect of our bushings is that they are available at minimum market prices. Besides, we are counted amongst the most illustrious carbon bushings manufacturers and graphite bushings suppliers in India.